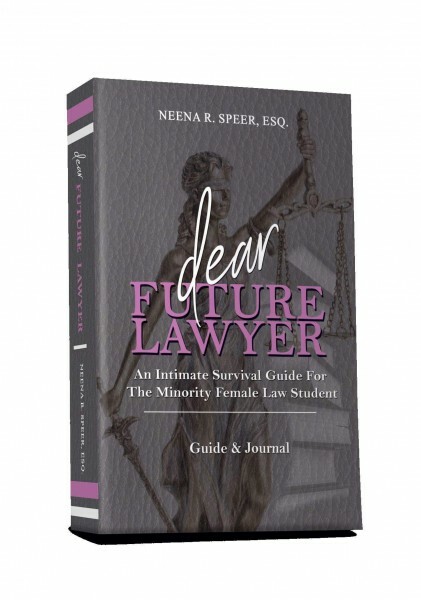 Dear Future Lawyer: Advice for Minority Women Law Students From Author Neena R. Speer, Esq. | Blog | Ms. JD | Determined to Rise. In 2018, the American Bar Association reported that less than 40% of lawyers in the United States are women, and that less than 20% of lawyers in the United States are people of color. As the statistics make clear, women of color are overwhelmingly outnumbered in the legal profession. Having experienced this isolation herself, lawyer, author, speaker, and nonprofit founder Neena R. Speer, Esq. seeks to help provide solace for this underrepresented population by sharing her experience with other women of color on their journeys to becoming lawyers. As a minority woman lawyer myself, I am happy to share this conversational interview I had with Neena about her book with authentic guidance for minority women pre-law and law students, how her faith has gotten her through her struggles in law school, and what she has planned for the future to reach more women with her message. Roberta: Neena, thank you so much for taking time to answer questions for me as the inaugural member spotlight for Grace for the Grind™ Career Mastermind! Let’s start off with an introductory question; where did you go to law school and what type of law do you practice? Neena: I graduated from The University of Alabama School of Law in 2017 but would be remiss not to mention that I am a proud Howard University Class of 2014 Alumna. I am a solo practitioner. Thus, I recently created my own law firm where I specialize in criminal defense and business formation cases. I also work on probate, trusts and wills in addition to some family law. Roberta: Wow, I am always impressed to see young attorneys who are solo practitioners. What led you to open your own law firm? Neena: You often hear talk in law school about hanging your own shingle. Few decide to do it. The harsh reality I faced was that even after many interviews, I was not finding the opportunities most beneficial to my career goals, family concerns, and financial needs. I also encountered the hard truth that we all face when deciding whether to work for a company or ourselves: self care and mental health concerns post failing the bar the first time. I realized that even if I had worked the long hours in an office, there would always be a ceiling to my wealth. I also realized that most companies were not willing to pay the value of my license to practice law. They had set salaries and set benefits. It all sounded easy, but as I told my parents throughout the years: easy is not exciting. I wanted to learn how to build something that would last and make a meaningful difference in my community. I have wanted to do so since I was in 8th grade. Finally, a mentor of mine sat me down as I was expressing all of these thoughts after coming up short of a job. She said, “Neena, I honestly see you starting your own firm. You have that spirit about you.” After hearing about how scary it was for so long, I finally decided to do it and have been excited about the journey thus far. My hope is that someone who leaves law school has the courage to put themselves first and really think about what they want to see in their lives in the next five years. Solo work, though quite difficult to maintain when first starting, has the power to make any successful new lawyer realize how much more there is to learn. It is a constantly challenging environment and it forces one to evolve in efficiency and preparation because it is your responsibility and your behind on the line. I have seen so many benefits in this area from lawyers willing to help, to the freedom of picking the clients you want, and to becoming your own boss and holding yourself accountable. Roberta: That’s amazing, Neena. This could be the topic of a whole ‘nother conversation I’m sure many would be interested to read! But for today, let’s get into your new book and the story behind it. Why did you write Dear Future Lawyer: An Intimate Survival Guide for the Minority Female Law Student? Neena: I created this book for not only women of color, but it was created to be a safe space for women of color pushing through the difficult challenges of law school. This guide and journal is for minority women who sometimes have felt alone and needed a safe place to express themselves. This book acts as a companion to law school. When I wrote this book, I was a 1L struggling to stay above water. All I knew at the time is that I needed to write something to motivate myself. After passing the bar on my second attempt, I published this interactive guide and journal to empower other women who are going through what I have overcome. Roberta: You mentioned the book is a guide and journal. Why does the book have a journal component? Neena: How often have you been given self-help books? Most times my target audience ends up writing notes to themselves in the margins of the pages to help bring their experiences to life and connect with the physical book. The guided questions force each future law student to get in touch with the harder self-reflective aspect of reading a guidebook. The journal portion is my response to reader's’ needs when looking for empowerment and help in a difficult journey. Roberta: That’s great. So often we read books but don’t know how to actually apply what we learned to our lives. It sounds like the way your guide and journal is set up, readers are better able to apply the nuggets of wisdom you give. One thing you are quite candid about is your faith. What role has faith played in your success in becoming a lawyer? Neena: My signature catch phrase is #GodsGotIt. It started in law school as reminder to let go and let God. However, as all hard-headed children, it took me a while to truly let go and let God until one day I was so frustrated with school and personal obstacles that I was searching for anyone to help me find the words to encourage myself. I thought about quitting but then I realized I had way too many people who believed in me before I even got accepted. When I was a 1L, a mentor said it was important to thrive while I was in law school. When I was a 2L, I hit a lot of momentum and now after my 3L year and passing the bar you can see how my perseverance in spite of my mentality led to the blessings that have unfolded. If ever you are in doubt, read the words from Romans 8:18 in trying times. I am living proof that breakthroughs are real. Roberta: That is such an important reminder, what Romans 8:18 says, that the glory of what is coming is greater than the current struggles. I had to constantly remind myself of the future as well and remember what I was working toward when I faced challenges in law school. You mentioned your mentor’s words being motivating for you and I think that goes to a larger point of the importance of finding a community of people who encourage and uplift you, like what is found in the online community of which we are a part, Grace for the Grind™ Career Mastermind. Why do you think communities for women lawyers and law students are important? Neena: As a Black and Indian woman interested in pursuing a lifelong career in the practice of law, I constantly have feelings of defeat, hopelessness, and a baffling sense of determination. According to Derrick Bell, the first tenured African-American professor of law at Harvard Law School who is largely credited for being one of the originators of critical race theory, “many women of color derive strength from oppression” and that is a “puzzling contradiction” to many. However, it’s more important to know why a Black woman should “have to” suffer oppression to be successful? The answer is far more complex and warrants an explanation. These same women of color have been left out of the classrooms, boardrooms and courtrooms. Thus, when they do reach those positions, it seems that society has already placed obstacles directly in their path so that their top positions are too difficult to manage. My hope is to share my own truth and the obstacles I've faced to inspire future minority women to step out of the shadows and to exude confidence in their field and daily lives. Roberta: That’s powerful. 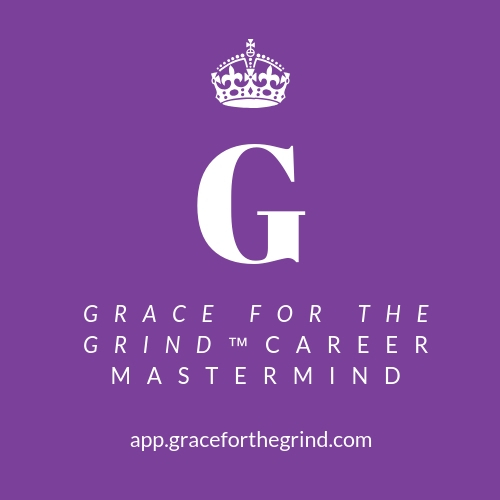 On February 11, 2019 at 7 pm, you are going to be hosting a live event for members of the Grace for the Grind™ Career Mastermind. What will you be discussing in your live event for Grace for the Grind™ Career Mastermind? Neena: Service in Leadership. As John C. Maxwell said, "Leadership is not about titles, positions or flowcharts. It is about one life influencing another." We should each strive to make life better for one person. This kind of mindset is often lost as we strive for accolades and awards. Women today already sacrifice so much trying to help others. This profession or any profession for that matter means we have to understand that quality service to others is far more valuable and critical than quantity of service. That is why the main focus for this talk is integrity. We have to see more than just what we can get from people. This service begins when you take the time to get to know everyone in the building from the janitors and security guards (service men and women) to the dean and trustees (those entrusted to lead others) and speak to each with the same level of respect. Roberta: Everything you said is so true. I love that you quoted leadership expert John C. Maxwell! I am a certified leadership coach, speaker, and trainer with The John Maxwell Team and implementing his teachings in my personal and professional life has been transformational. We are not usually taught leadership in law school even though lawyers are considered leaders in society by default, so leadership is an important concept future lawyers should grasp as soon as possible. What other advice do you have for aspiring lawyers? Neena: The hardest part about going to law school is feeling confident in the seat given. What I mean by that is that your talents and intelligence matter less than identifying what makes you feel confident when you are doing your work. The people with the highest grades are not the most valuable people in the school. Being president or leader of an organization does not make you more likely to find success. The way you ultimately treat people and make them feel are the markings of a truly great attorney. That mindset gets lost in our quest for A+'s and Federal Clerkships. Roberta: Amen! I am so enjoying this conversation with you and the words you are giving that someone needs to hear. We are nearing the end of the interview so I just have a couple more questions for you. You often go by “The LAST Brand.” What is that and what are you currently working on with the LAST Brand? Neena: The LAST Brand stands for Lawyer, Author, Speaker, Truth. You might want to be a lawyer, author, and speaker, but it is all housed in being a truth teller. That means to be unafraid and unbothered to tell someone what you went through to get to where you are now. It means true vulnerability and security for those who come to you and those who seek you out. When you L.A.S.T., that means you leave the LAST impression that counts. My big objective for 2019 is to have one big organization invite me to their law school to work with their 1Ls on effective strategies for success in law school for their female minority students and whoever else wants to come. I want the school to invest in my books for their students and guide them through the rough patch of this new beginning. I hope I meet someone who helps connect me to really making that opportunity happen. That would be amazing! Roberta: That would be amazing! How can people connect with you? Through my Instagram @Neena_Rani or @dearfuturelawyer for my team. Feel free to shoot my team an email at neenathelastbrand@gmail.com for booking information or how to do one-on-one law school coaching sessions with me. That was awesome, Neena! Thank you for sharing this wisdom. I look forward to hearing you speak to members of the Grace for the Grind™ Career Mastermind on February 11, 2019 at 7 pm and answering their questions! 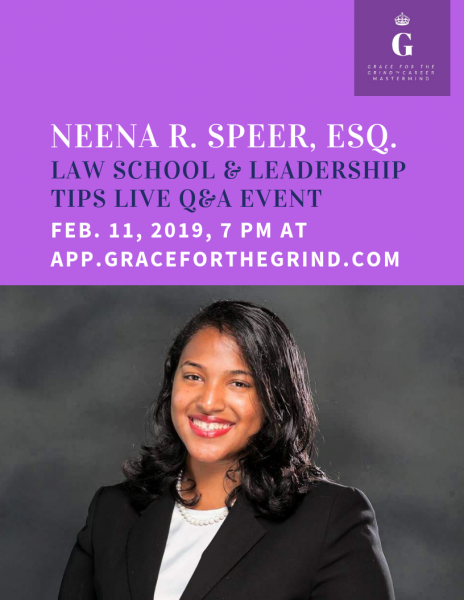 Women lawyers, law students, and pre-law students can join Grace for the Grind™ Career Mastermind for a FREE one-week trial to attend Neena’s talk, ask questions, and participate in other activities in the mastermind, such as discussion forums and career challenges. Attendees of Neena’s talk are also eligible to receive a special gift if they purchase her book, Dear Future Lawyer: An Intimate Survival Guide for the Minority Female Law Student. More details can be found in Grace for the Grind™ Career Mastermind.